This gadget that we spotted comes from CSI Las Vegas, Season 8 Episode 11. I forgot what the title was but it was the one with the cowboy and all that bull riding. When the cowboy was in the morgue and Catherine and that assistant in the morgue took off the cowboy's boots, we see a bunch of things come out and one that fell out was a cellphone. The guy quickly grabbed it and it was too quick for anyone to really notice but I've managed to get a screenshot and here it is below. So what kind of cellphone is it? Well, judging from the M logo and the thin style, it's a Motorola Razr phone but since Motorola probably released a couple of RAZR models, which one is it? 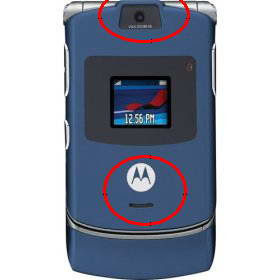 Well, from the big camera lens in the front and the little opening below the Motorola logo, it's a Motorola RAZR V3. 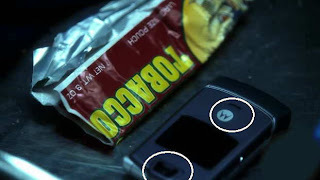 The Motorola RAZR V3 is a very popular model, I don't know whether it's because Motorola has been sponsoring most of the TV shows in the US but I've managed to catch of a glimpse of the Motorola RAZR phones in TV shows as well as in movies. Well, since half of America probably owns a Motorola RAZR, I won't go into much detail, just that this one is pretty much standard with a 1.3 megapixel camera. Nothing really awesome but it's a decent and solid phone. If I were you, better get the new RAZR2 models. That was cool Gadgets. Hope to have one for me.